I have already written article to integrate Salesforce with other Salesforce instance around 3 years back. In last 3 years, Salesforce has changed a lot. This time I will integrate Salesforce with other Salesforce only only in 5 lines of code, can you believe it 🙂 ? Check my old article, and its around 50+ lines of code with security control. What is Named Credential ? A named credential specifies the URL of a callout endpoint and its required authentication parameters in one definition. You can simplify the setup of authenticated Apex callouts by specifying a named credential as the callout endpoint. You can instead specify a URL as the callout endpoint and register that URL in your organization’s remote site settings. In that case, however, you handle the authentication in your code. Doing so can be less secure and especially complicated for OAuth authentication. Long description short , “using Named Credential, we can make call out to external system without supplying username or Password”. For first 2 steps, you need to go through this article which explains in detail how to define Connected App and Authorization Provider. Now, directly start with step 3 to create Named credential by navigating to “Setup | Administer | Security Controls | Named Credentials | New Named Credential “. Make sure to check “Start Authentication Flow on Save” and click on Save. After clicking on “Save” new page will open to authenticate Salesforce Org using OAuth2 connected App. 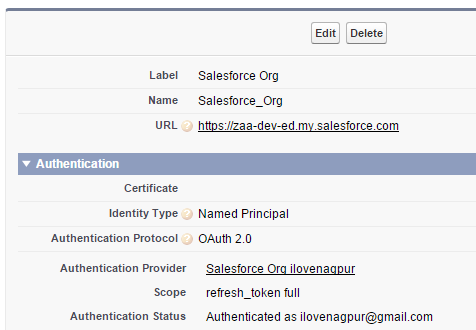 If authentication is success, you can see message like “Authenticated as <Salesforce Username>” as shown in below image. Now execute below code in anonymous Apex and you should be able to see list of all REST API available in Salesforce instance. You can consume standard as well custom webservice of other org using this approach. Thanks Jitendra, Its more than awesome! I am try to connect my one dev org with my another dev org but when i try to authenticate named credentials .It gave me below error. We can’t log you in because of the following error. For more information, contact your Salesforce administrator. SAME_ORG_SSO: Cannot sign on into same org. I am providing my second dev org domain URL in the named credentials URL.Please let me know if i am doing something wrong. It seems you are trying to access same org using Named credential. We need to separate Salesforce org for this example to be working. Hi Gurditta, If only SSO is enabled then this will not work. As Named credential is used with supported Authenticators , Salesforce is one of them. 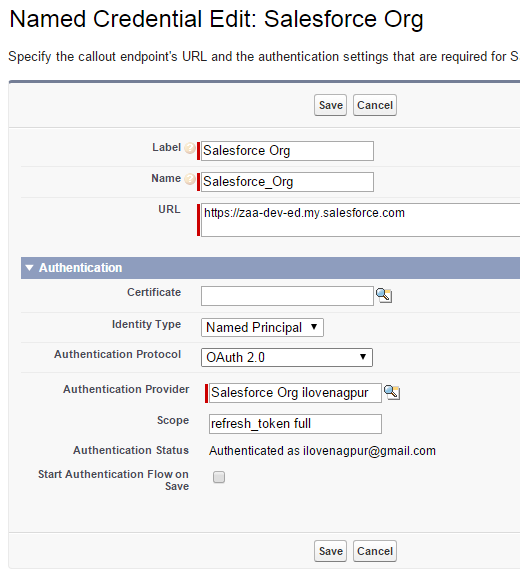 One way is to enable Salesforce Login from My domain. Setup connection. Make sure users Password does not expire using profile. And disable Salesforce Login again from My domain. Let me know if it works. Jitendra, I got a connect and I’m getting stuff back which is good however, and this is due to lack of knowledge, how would I send a request to get, for example, accounts based off of an ID? Please help with the below points. 1. I already have a connected app which the external system used to communicate to sales force. so when i use Named credentials i should create one more? cant we give any name to the connected app name, is the name having any significance? 2. External system has provided certificates as well. How ill i upload that in certificates and key, as i dont see an option. Im getting HTTP Code : 302. How do you fix this? This blog is really very helpful for me and implementing the process as you have mentioned in the blog. I am getting the following error in callout.